IBM® Enterprise Content Management (ECM) solutions provide efficient and effective ways to capture content, manage the content and business processes, discover insights from the content, and derive actions to improve business processes, products, and services. 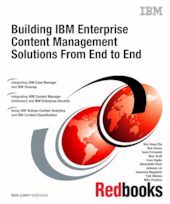 For each product involved in the ECM solution, this IBM Redbooks publication briefly describes what it is, its functions and capabilities, and provides step-by-step procedures for installing, configuring, and implementing it. In addition, we provide procedures for integrating these products together to create an end-to-end ECM solution to achieve the overall solution objectives. Not all of the products are required to be integrated into an ECM solution. Depending on your business requirements, you can choose a subset of these products to be built into your ECM solutions. This book serves as a hands-on learning guide for information technology (IT) specialists who plan to build ECM solutions from end-to-end, for a proof of concept (PoC) environment, or for a proof of technology environment. For implementing a production-strength ECM solution, also refer to IBM Knowledge Center, IBM Redbooks publications, and IBM Software Services.